Floor Covering News has just issued its 2nd annual Guide to using Social Media in Business. I am particularly excited about the 2011 Guide because I was invited to contribute... an article titled "Social media is a legitimate tool for business". Bill Buyok from Avente Tile described his experience with the Avente Tile Talk Blog in "Build your small business with a blog" on page 12. 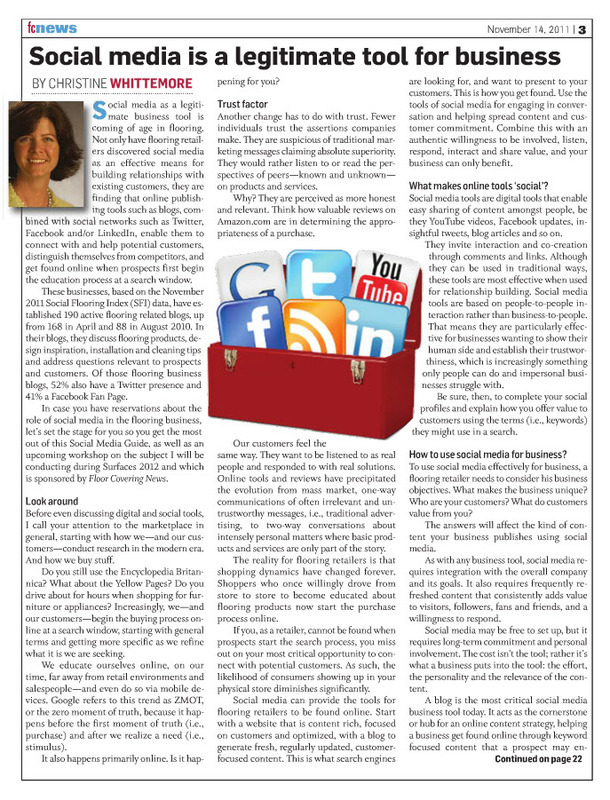 Paul Anater from Kitchen and Residential Design wrote about "How to drive business through Twitter" on page 10. Sima Dahl from Parlay Communications offered LinkedIn advice in "5 steps to market yourself on LinkedIn" on page 20. Lauren Rhodes-Braden from Floor Trader of Gulfport & Gautier, Miss and Mobile, AL, discussed how she uses Facebook in "Making your Facebook work for you" on page 8. Irene Williams from QRHere offered advice on mobile technology in "The market is going mobile and so should you" on page 13. You can access the digital edition of FCNews' Social Media Guide for Business 2011 by clicking on this link. If you attend the Surfaces 2012 Workshop on Social Media: How To For Business on January 23, 2012 from 9am to noon, we will have copies of the Guide to share thanks to our workshp sponsor, Floor Covering News! I'd love to hear what you enjoyed most about the FCNews Social Media Guide for Business 2011. What do you see implementing for your business?